This deeply nourishing oxygenated formula is a proprietary blend of oils and minerals combined using a revolutionary fermentation process. 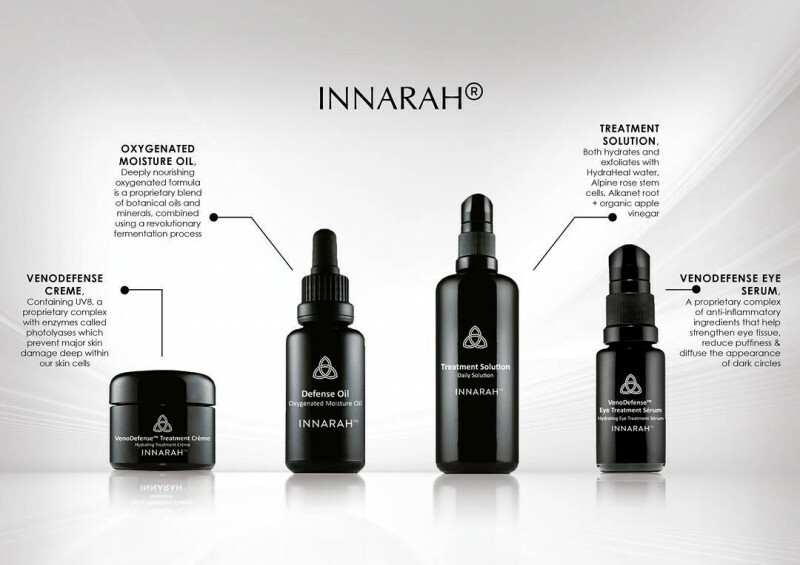 The final formula is easily recognized and accepted by the skin. 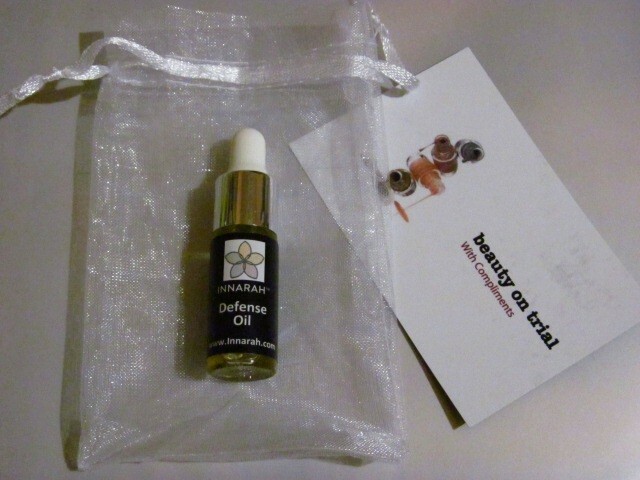 The oil is beautifully absorbed and protects the skin from environmental aggressors. Skin looks revitalized on contact and, over time, the appearance of lines and wrinkles are reduced. 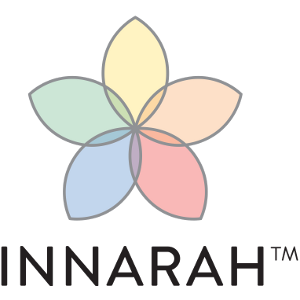 - Which Innarah product is better for you? 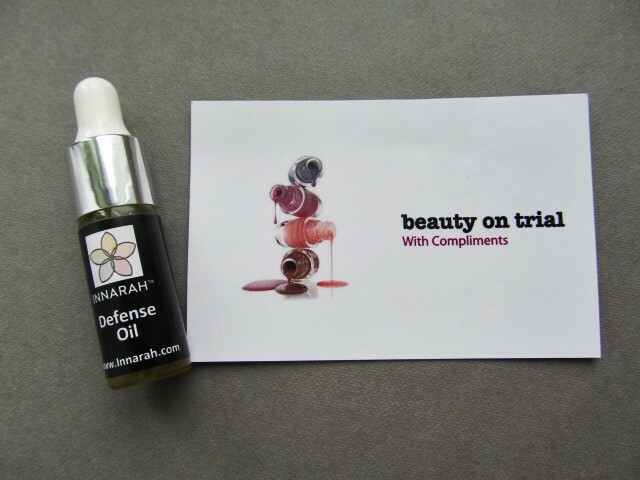 Apply 1-2 drops to face, neck décolletage and orbital eye area. Use day and/or night. Skin will absorb within 15 minutes. 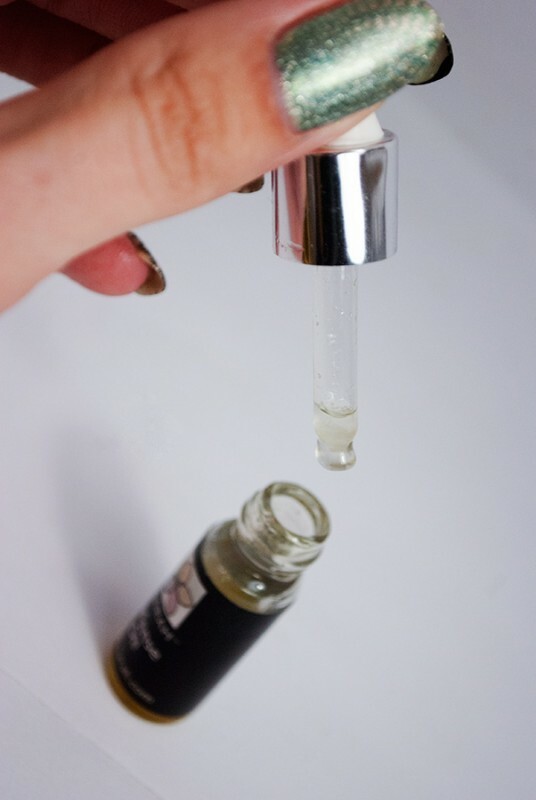 A deeply hydrating oil that has a unique composition that applies and delivers the effect of an oil but absorbs leaving the skin feeling silky and smooth without shine. This is a terrific moisture intensive product that works well with all skin types and is highly effective on very dry skin. Kukui Oil, Coconut Oil, Sea Buckthorn Oil, Jojoba Oil, Oregano Oil, Elk Antler Velvet, Chamae Rose, White Gold Ormus, Rose Otto Oil, Sandalwood, Frankincense, Myrrh, Agarwood, Blue Lotus, Carrot Seed, Bergamot, Jasmine, Patchouli, Melissa, Helichrysum, Arnica, Calendula, Marine Phytoplankton and Phytoplasma Minerals, Amazon Botanicals Herbs, Lemurian Quartz Crystal. 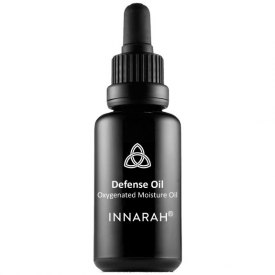 INNARAH Defense Oil Oxygenated Moisture has been an extra treat for trial from the B.O.T. team and has come in a sample volume. The first thing which is immediately likable about this product is its design - consice bottle with a handy pipette. The liquid inside is a translucent one with a distinct terracotta or orange tint. 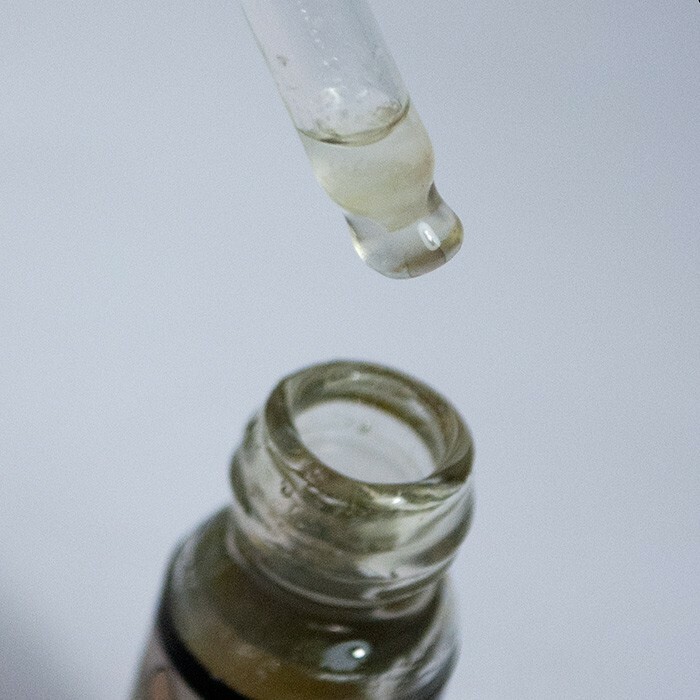 I guess that on its way to me (during the transportation) the item has been subjected to a low temperature at some point because some of the liquid has clogged into an amber-like gelly parts. The scent is not a pleasant one, reminding of my granma's cosmetics from her youth, but luckily it fades quickly after the application. 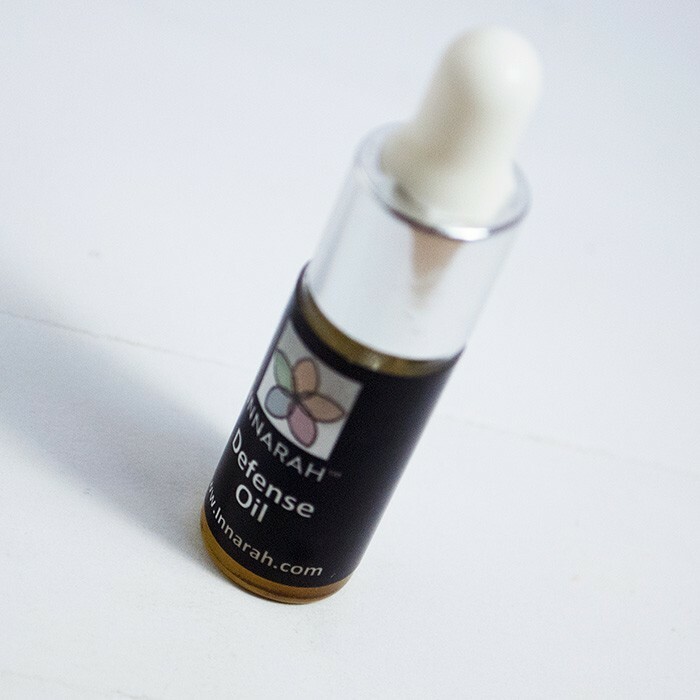 This oil absorbs quite decently and after that I swear there is some slight cooling effect to the skin, which feels pleasant and envigorating even. The skin feels supple and moisturized following the procedure. I have not witnessed any visible anti-age effect on my skin (but this may be due to a short time of exposure to the product). I do not (thanks God) have many skin issues so I can't vouch whether this oil has an anti-bacterial effect. In summary and taking a peek at the price I wouldn't probably buy it. It may be a great product in all other respects but I guess there are similar ones at a lesser price. 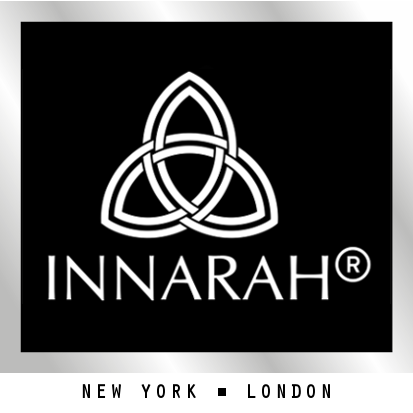 I hadn't heard of the brand Innarah before so had to read up about. It sounded like an oil that was going to be a good treat for my skin. I have sensitive dry skin and I do get alot of break outs (blotchy rashes) on my face from alot of products I try. 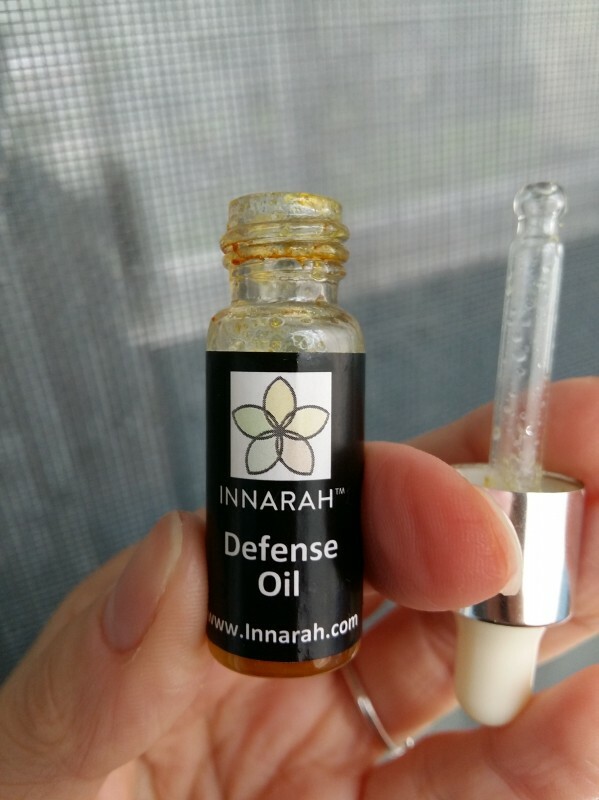 My dropper didn't pick up any of the oil so I had to just dab it on my skin which meant I didn't know how much I was using. Being able to see the oil is a bit off putting but I saw they sell it in the purple bottles which have a luxury expensive look. This means you don't see the sediment collecting in the bottle. It does collect around the opening of the bottle shaking didn't remove that, I used a cotton bud with hit water but made sure it didn't go into the oil. But they do warn about this and as it's natural and herbal it is to be expected. It's best to keep it at room temperature as it does tend to start solidifying. My bedroom is always cold so i pit the bottle in the palm of my hands to warm it up and the sediment goes when shaking the bottle but not fully. 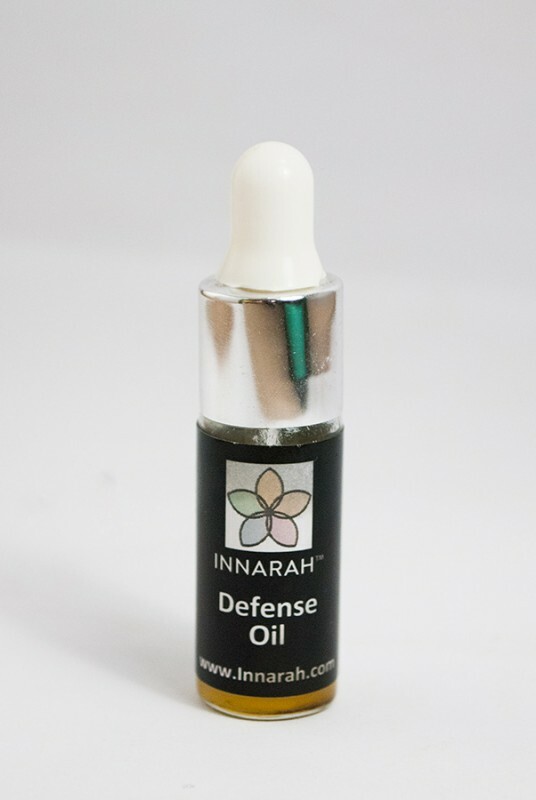 The oil is smooth and when applied to the skin absorbs instantally. It does have a strong scent which was a bit off putting but it fades away quite quickly. I do like this product and loved how soft my skin was and it soothes any sensitive skin and also has a slight warning too it. It's deeply hydrating and moisturising and as a multitude of natural healing, anti inflammatory, anti bacterial properties. I have only noticed a difference in the smoothness of my skin and how hydrated it feels. I use this twice a day it compliments the moisturiser you use and gives the skin a boost of hydration and the skin feels nourished. It doesn't leave your skin looking greasy or shiney and can be used under your usual makeup for an added boost of moisture. I'm pleased I was able to trial such an expensive product and feel like it really does make a huge difference to your face and neck. My skin felt revived and deeply hydrated and nourished. If you can afford to spend alot of money on skincare products then this will be perfect to add to your daily skincare routine. I'm on a low income and car afford to spend hundreds of £'s on one product. Which is a shame as I am enjoying using it. I'm not going to recommend this product due to the fact of most people not being able to spend so much money on one product. 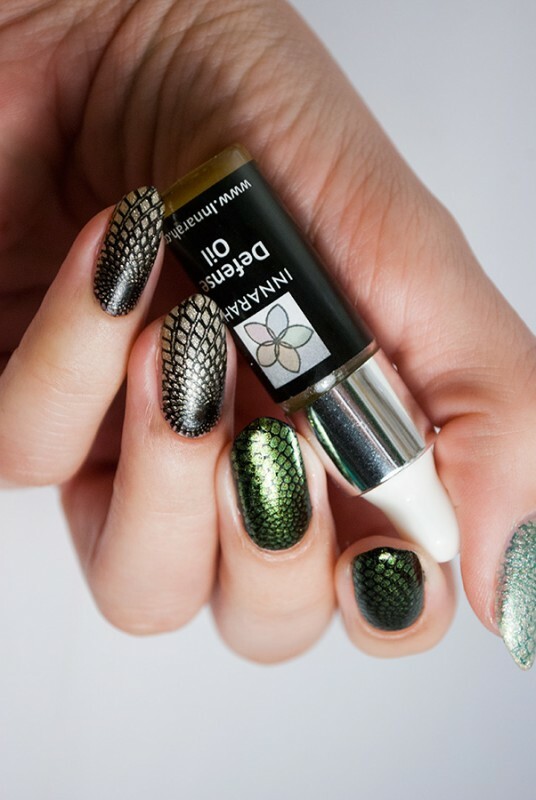 I really liked this product. The composition of which is - good, natural. Excellent podhodtit for sensitive skin. I have sensitive skin and every produktmne suits, but this came up. Good, fast and does not leave vpityvaetsya after sebyasled. It has a pleasant smell of natural components. Well it moisturizes. Uhaivaet skin. Excellent tool and the price for a normal quality, but I can not right now often buy it. Excellent moisturizes and nourishes the skin. My skin can be very temperamental and this product didn't irritate it at all, it absorbs well and offers good hydration. I have enjoyed using the product and felt like it did help my skin look more youthful and cared for, being a completely natural product is also a huge plus as it is much healthier for my skin. 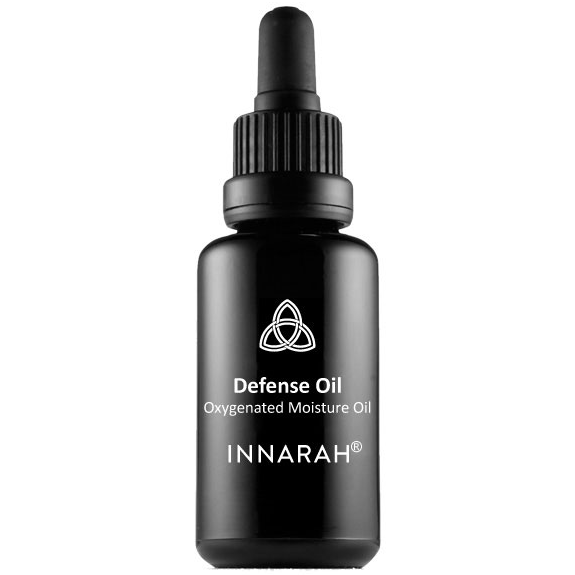 I also suffer from hormonal acne and this product didn't cause my skin to flare up at all, and was quite soothing on the dry patches I get around my cheeks. Overall this is a great product, a couple of niggles is that the bottle may need some redesigning and it does have quite a strong herbal smell but the biggest weak point it the price, it isn't something that would be seen as affordable for people on low income which is unfortunate as it is a fantastic product. I got to test this product. I liked it very much. It deeply nourishes the skin. And also very well moisturizes it. Skin looks healthy, radiant and youthful. 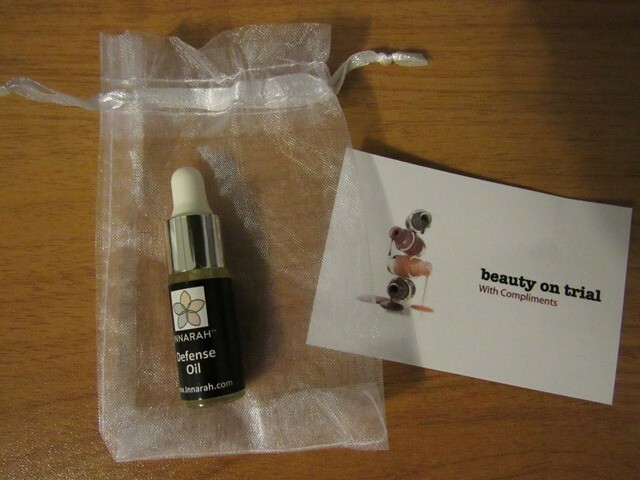 My face has become a healthy complexion.I would recommend using this oil. It is natural and effective. Especially for those who have a problem and oily skin.